The 1945 20th Century Fox film, 'Junior Miss' was also adapted from Sally Benson's characters. Shirley Temple at CBS mike. An apocryphal tale says that Welch's 1949 mint confection 'Junior Mints' was inspired as a pun on the cultural popularity of Junior Miss over various media. 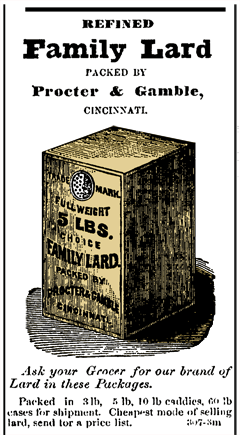 1869 Procter & Gamble 'Family Lard' ad shows their 'man-in-the-moon and stars' trademark already in use. 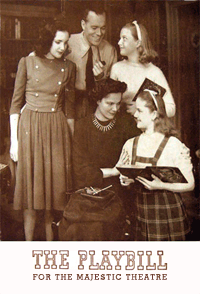 "Junior Miss (adapted from Sally Benson's stories by Jerome Chodorov & Joseph Fields; produced by Max Gordon). Last season Adapters Chodorov & Fields turned Ruth McKenney's My Sister Eileen stories into a gay comedy about youth which is still running on Broadway. Last week they had turned Sally Benson's Junior Miss stories into a gay comedy about adolescence which should still be on Broadway a year from now. For its characters are kids at once harum-scarum and "nice," and it mirrors the kind of middle-class family life which huge audiences chuckle at." At the center of this domestic slice of middle-class, 1940s life was Judy Graves, described as a pudgy, bright-eyed, passionate 13-yr-old. 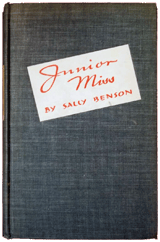 The literary brilliance of Sally Benson exploded nationwide in the Spring of 1941 with her Doubleday collection of 'Junior Miss' stories originally published in The New Yorker magazine over the previous twelve years. 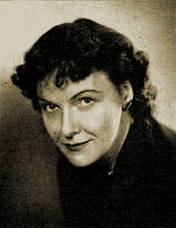 She'd begun her journalistic career in the mid-1920s writing interviews and film reviews for the New York Morning Telegraph. But it was her ninety-nine Junior Miss stories in The New Yorker that captured the interest of an increasingly wider audience. Within a year of the publication of Sally Benson's collection of Junior Miss stories, they were being adapted into what would become a wildly successful Broadway play of the same name. 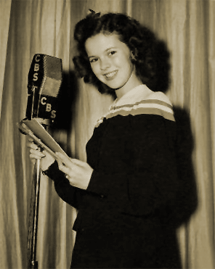 By a year later, in 1942, Benson's Junior Miss would find her way to Radio for a full season, embodied by no less than 14-yr-old Shirley Temple herself. 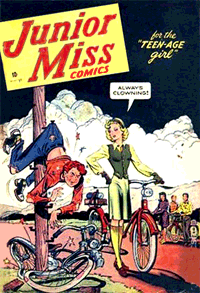 1944 found Marvel Comics publishing its first Junior Miss comic book. By 1945, Sally Benson's Junior Miss franchise was expanded to Film in a 20th Century Fox production of the same name. Following the success of the Junior Miss film, and buttressed by the Marvel Comics Junior Miss series, the "fan-chise" yet again found its way to Radio, this time portrayed by Barbara Whiting, who'd appeared as Judy Graves' quixotic pal, Fuffy Adams, in the 1945 feature film. That radio series ran from 1948 to 1954. A quick scan of the above list will amply demonstrate why serial melodramas of the era were referred to as 'soap operas.' Procter & Gamble was a steadfast sponsor of 'soaps' throughout Radio's Golden Age. British candlemaker William Procter and Irish soapmaker James Gamble had emigrated to the United States during the early 1800s, eventually settling in Cinncinati, Ohio. Sisters Olivia and Elizabeth Norris brought the unlikely pair together through marriage. The girls' father, Alexander Norris, subequently persuaded his pair of new sons-in-law to become business partners, and on Halloween 1837 they formed Procter & Gamble. By the mid-1850s their sales had grown to $1 million and they were employing approximately eighty workers. Seizing on the outbreak of The Civil War, Procter & Gamble won contracts to supply the Union Army with both soap and candles. 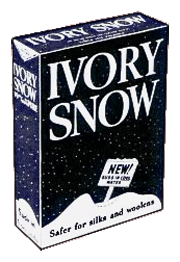 During the 1880s, P&G began marketing inexpensive floating soap bars--the Ivory Soap we know today. Thereafter followed a period of rapid expansion, extending their factories well outside of Cinncinati, and diversifying into products such as Crisco, the now ubiquitous shortening made of vegetable oils as opposed to animal fats. The advent of Radio brought them even greater opportunities to expand the reach of both Ivory and Crisco, and their several sponsored serial melodramas soon became identified as "soap operas" in the popular vernacular of the day. Tide laundry detergent emerged in 1946, Prell shampoo in 1947, Crest toothpaste in 1955, Charmin paper towels in 1957, Downey laundry softener in 1960, and Bounce dryer softener sheets in 1972. Their innovative Pampers synthetic diaper line was first test-marketed in 1961. Continued diversification throughout the remainder of the 20th century found P&G acquiring Folgers Coffee, Pepto-Bismol, Noxzema, Old Spice, Max Factor, and Iams, among many others. "And there appeared a great wonder in heaven; a woman clothed with the sun, and the moon under her feet, and upon her head a crown of 12 stars." "Some" claimed that the trademark was a "mockery" of the above quoted verse, ergo the 116-year-old, iconic trademark "must be satanic." The ending curls of its flowing beard were said to be a mirror image of the number "666"--the reflected number of the mark of the beast. And last but not least, where the flowing hair at the top and bottom meet the surrounding ring of the 'moon', were said to be "the two horns of the ram." So sensitive was the giant international conglomerate to such a concerted--albeit spurious and ridiculous--attack, that it ultimately dropped its iconic trademark of over one hundred and sixteen years in 1985, and at a cost of millions of dollars in rebranding and repackaging. 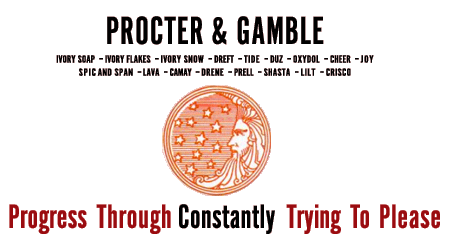 But as must be obvious from the 1869 Procter & Gamble newspaper advertisement in the sidebar (left), a rendition of P&G's man in the moon had graced their products as early as the post-Civil War years--without objection from either The North or The South during America's most divisive and tumultuous years. CBS had brought internationally beloved child star Shirley Temple to radio during the Christmas season of 1941. That program, Shirley Temple Time, was a four-week series of Christmas dramas and comedies starring Shirley Temple and co-starring four iconic Film stars of the era, one per week: Warner Baxter, Robert Young, Lionel Barrymore, and Humphrey Bogart. Shirley Temple, by then in her early teens, was making an attempt to relaunch her career in the midst of continuing private tutoring and finishing schools. No longer the curly-haired little kewpie doll of her former Film fame, Temple was attempting to recast herself as a viable teen star of the era. During the intervening years several other young actresses had begun to capture the hearts of American audiences. Thus, Shirley Temple Time, Temple's first lead-vehicle over Radio became Miss Temple's first volley in her attempt to regain her previous fame. Another CBS production, Shirley Temple Time had been sponsored by Elgin Watches, and was widely and aggressively promoted throughout the Christmas season of 1941. CBS apparently thought enough of Miss Temple's performances over Shirley Temple Time that it began considering an even more ambitious radio vehicle for young Miss Temple. 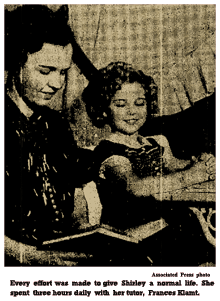 The recent success of Sally Benson's collection of Junior Miss stories, coupled with the recent success of the new Broadway adaptation of Junior Miss, encouraged CBS to bring Junior Miss to Radio, with Shirley Temple in the lead role of Judy Graves. Needless to say, Procter & Gamble also felt that Shirley Temple and Junior Miss were a promising combination--to the tune of a reported $12,000 per episode. Junior Miss premiered over CBS on Wednesday evening, March 4th 1942, a mid-season replacement for the first half-hour of Fred Allen's hour-long Texaco Star Theater, which had moved to Sunday evenings. This became the first time that Fred Allen had not been heard on Wednesday evenings in over eight years. Did CBS and Procter & Gamble think Junior Miss was a big deal? Apparently so. 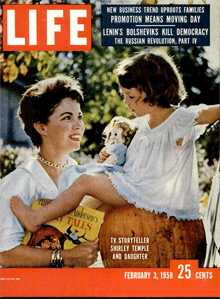 LIFE Magazine featured Shirley Temple Black in its February 3rd 1958 issue. Shirley Temple, the adorable moppet of the movies of a quarter of a century ago, has emerged from retirement and has rocketed to the top of television. Breaking a promise to resist all lures to resume her career, she has responded to the clamor of a public that remembers her as "Little Miss Marker" and the clamor of a public that never had seen her. Now happily married and a model wife and mother, Shirley is Herbert Kamm's subject for a series of six articles, of which this is the first. On Sunday evening, Jan. 12, at 5 p.m., Pacific Coast time, Shirley Temple smiled that incomparable dimpled smile of hers into a television camera in Hollywood. In a twinkling of an electronic eye, millions of Americans suddenly felt a little older, and for millions more, familiar with the name of Shirley Temple only because of what they had read or heard from nostalgic elders, a legend had come to life. 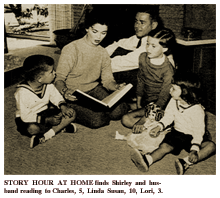 It was in consonance with the title of her television series -- "Shirley Temple's Storybook" -- another dramatic chapter in a saga so filled with wonder that even some of the fairy tales in her TV repertoire pale by comparison. A QUARTER of a century has passed since an adorable moppet with a riot of blonde curls romped across movie screens in such memorable films as "Little Miss Marker," "Rebecca of Sunnybrook Farm," "Curly Top," "Poor Little Rich Girl," and "The Little Colonel," all of which are being seen again or soon will be, on television. But the rush of the years didn't obscure the Shirley Temple image, and it surprised no one when her maiden appearance on live television captured one of the largest audiences in the history of the medium. She looked indeed like a fairy princess as she stood before the cameras at NBC's color studio in Hollywood, not far from the movie lots where she became the most beloved little girl in the world. 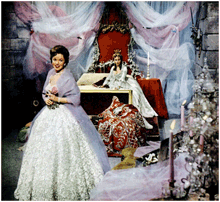 SHE WORE a gown of pink and blue net with an outer skirt of imported French lace, its sequins glittering. A filmy stole caressed her bare shoulders. Her hair, now a deep brown with a slightly reddish tinge, heighted flawless complexion. And then, of course, there was that smile with the corners of her mouth dimpled. Actually, her role in this initial telecast of her 16 special one-hour programs based on classic fairy tales, was relatively minor. In a voice still sweetly reminiscent of her childhood triumphs, she sang her theme song, "Dreams Are Made for Children," and then merely supplied the necessary narrative for the portrayal of "Beauty and The Beast." But it was the magic of Temple which lured viewers--the return of the delightful darling who has, to be sure, grown up but who also will always be the Shirley Temple of yesteryear if she lives to be a thousand. THE LEGEND is indestructible, not only because there is none in entertainment history to compare with it, but because Shirley's life has been as ideal as one could wish. Even the imperfections have turned out for the best. When her acting career foundered in the high seas of teenage awkwardness, she quietly withdrew into retirement to learn, as she put it in a recent interview, "the art of maturing." She had learned it beautifully. The greatest test of her mettle came at 21, when her marriage to Joh Agar, Jr., an Army sergeant who later became an actor, collapsed after four trying years. Hollywood skeptics and even a large segment of her public, viewed the experience as one which would shatter her. It not only didn't shatter her but, she feels, prepared her for what is now an idyllic union with "the best and finest person who ever dame into my life" -- Charles Black, nine years her senior, a tall, handsome soft-spoken business executive whom she married a year after the divorce. AT 29--she'll be 30 on April 23--Shirley is a contented, blissfully happy wife, mother (Linda Susan, 10, Charles Jr., soon to be six, and Lori, soon to be four), interior decorator, gardener and civic worker. Also part-time actress. Why the comeback? It certainly wasn't for money. Shirly started working for a salary at the age of four, getting $150 a week when $150 was real money. By 1937, when she was nine, she was making $300,000 a year, the seventh largest-salaried income in the country. "Those TV producers just wore me down," she said of her capitulation. "They kept after me. They pointed out that 20th Century-Fox had released all of my old movies to TV. They said, "Why don't you let the public see you as you are--not as you were?" THE COUP finally was scored by Bill Phillipson, executive producer for Henry Jaffe Enterprises, who hatched the idea of Shirly serving as hostess-narrator--and occasionally the star--of a series of fairy tales. "I'm a pushover for fairy tales," Shirley confessed. "Furthermore, I've long felt there was a need for more shows that would appeal to the entire family, and certainly this series was designed with just that kind of family appeal in mind. So here I am." The financial deal--which can't be overlooked entirely, even in fairy tales--calls for her to receive a flat fee of $100,000 plus 25 per cent of the profits from re-runs. She has no financial interest incidentally, in the sale of her old movies to television. Shirley insists that the lure of the limelight was no factor in her decision. "I went into show business in 1932, which I was four," she said. The last movie I made, "A Kiss for Corliss," was released in 1950. That's 18 years of limelight, enough to last a lifetime. "WHAT'S important to me now is my marriage. To preserve marriage I've found a woman must first of all keep her husband happy. Keeping Charlie happy--that's what counts most in my scheme of things. Then come the children. If anything, the spotlight comes last." Tomorrow: The inside story of Shirley's first television show, and how her family reacted to it. March 14th 1942 Billboard review of the premiere of Junior Miss. Shirley Temple will begin a new radio series tonight, taking over half the time formerly occupied by Fred Allen. The other half will be given to Ransom Sherman, whose show moves from a Friday night spot. Allen's program will be on the air Sundays in the time relinquished by the Sunday Evening Hour. This will be Shirley's second radio series. The first was a brief pre-Christmas affair in which she shared honors with adult guest stars. Now she'll be in "Junior Miss," based on the Sally Benson stories, book, and Broadway play, to be broadcast at 8 over WBBM. 8 p.m.--Junior Miss (WBBM): Shirley Temple discovers she loves her dad. Making her second bow to radio audiences in her new "Junior Miss" radio series, Shirley Temple, in the part of Judy Graves, will air her views on child movie stars Wednesday at 9 pm. in a radio adaptation of Sally Benson's "Daddy Dear," story over WABC. In "Daddy Dear," a Saturday afternoon visit to the movies has a great--and almost disastrous--effect upon the Graves household. Having viewed a picture about a little Southern girl whose father gambled away the old plantation. Judy returns home and attempts to beguile and reform her own father in the way the little girl managed it on the screen. Mr. Graves' understandable confusion, and Judy's realization that she isn't the winsome type, make for a most amusing comedy sketch. In the role of Fuffy Adams, Judy's bosom friend, will be Priscilla Lyon, while Mrs. Graves will be played by Mary Lansing, Lois by Barbara Eilers and Hilda by Patsy Moran. 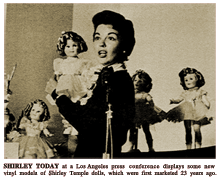 8 p.m.--Shirley Temple (WBBM): parade of family skeletons is threatened. 8 p.m.--Shirley Temple (WBBM): Judy coaches a quiz fan. 8 p.m.--Shirley Temple (WBBM): arranges an Easter egg hunt. KTSA -- 8:00--In another radio dramatization ot Sally Benson's "Junior Miss" stories, Shirley Temple portrays the problems and adventures of a 13-year-old. In Wednesday night's episode, Shirley, as Judy Graves, provides her mother with a good old-fashioned kind of Easter. 8 p.m.--Shirley Temple (WBBM): Judy turns health-builder. Armed with a new design for living, Judy Graves, as played by Shirley Temple, will persuades her family to go barefoot and adhere to strictly vegetarian menus until Mr. Graves, who loves a good thick steak, rebels in another amusing "Junior Miss" program on Wednesday at 9 p. m. over WABC. 8 p.m.--Shirley Temple (WBBM): Judy and her friend find $900. 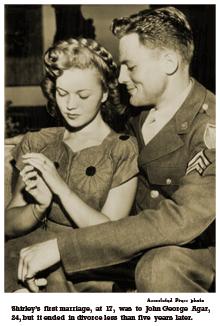 8 p.m.--Shirley Temple (WBBM): Judy Graves adopts a soldier. Private Albert Schmalfoos, First Class, discovers that the worst can halppen when he is adopted, via the U.S. Mails, by Judy Graves, as played by Shirley Temple, and that young lady's spirit for all-our for defense causes a roul of major proportions in the Graves' household on the "Junior Miss" broadcast of Wednesday at 9:00 p.m. over WABC. 8 p.m.--Junior Miss (WBBM): Shirley Temple, as Judy Graves, scoops the world. 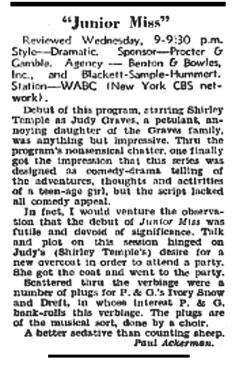 Judy Graves, played by Shirley Temple, and Judy's friend, Fuffy Adams, become newspaper publishers of the "Neighborhood Bugle" and scoop the world on a crime that rocks the nation and brings an army of irate "Bugle" readers to the Graves residence in another riotous edition of "Junior Miss" at 9 p.m. over WABC on Wednesday. Inspired by tales of the famous Pulitzer, the two girls pick up a cast-off mimeograph machine and launch their careers with headlines that scream of a horrible crime committed by friends of the family, and the repercussion that results is enough to send any would-be young publishers scurrying to the quiet and peace of a boiler factory. 8 p.m.--Shirley Temple (WBBM): and Mother's day. Out of cash and going all-out for Mother's Day, Shirley Temple, as Judy Graves, will introduce new temptations into the family until even Hilda, the maid, is almost lead astray in the "Junior Miss" broadcast over WABC at 9 p.m. When Judy discovers that her personal funds are insufficient for a suitable Mother's Day gift, she embarks on a cash-raising campaign that puts both Mr. Graves and Hilda out for the count of 10, and ends up in a financial impasse of major proportions. 8 p.m.--Junior Miss (WBBM): Shirley Temple, as Judy, in a dog-meets-girl romance. Falling in love--with a dog, develops into a family conflagration of five-alarm proportions when Judy Graves, played by Shirley Temple, essays the leading role in a hilarious Girl-Meets-Dog debacle on the 9 p.m. WABC "Junior Miss" broadcast. Judy, believing that a dog is a girl's best friend, sees no reason why Caesar, whom she finds running astray in the park, should be denied the privileges of the Graves dinner table, the cool, clean family bedspreads nor the use of father's old smoking jacket in lieu of a bath towel. Mr. and Mrs. Graves, however, are finally able to convince Judy and her friend, Fluffy, that the animal kingdom has definite limitations. 8 p.m.--Shirley Temple (WBBM): Judy gets first invitation to a formal party--but Fuffy doesn't. With Shirley Temple, as Judy Graves, invited to her first formal evening party, mild pandemonium reigns in the household only to be followed by a state of utter chaos when Judy mysteriously refuses to go and promptly breaks out in a threatening rash on the Wednesday "Junior Miss broadcast at 9 p.m. Taking issue with accepted standards of social behavior as set forth by Emily Post, Judy sees no reason why her own invitation shouldn't include her friend Fuffy, and she flings a shattering ultimatum into the face of time-honored tradition, with the result that parties are something which Mr. and Mrs. Graves don't want to discuss for a long time to come. 8 p.m.--Shirley Temple (WBBM): greet father's college chum. 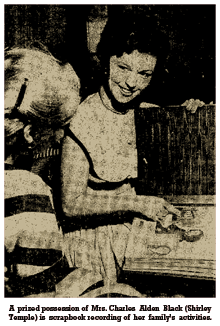 8 p.m.--Shirley Temple (WBBM): propaganda for votes. 8 p.m.--Junior Miss (WBBM): Shirley Temple, as Judy Graves, finds it's risky to spend $150,000 before you have it. 8 p.m.--Shirley Temple (WBBM): sponsors a benefit concert. 8 p.m.--Shirley Temple (WBBM): elects Dad to an aviation job. Piloting an airplane takes more than enthusiasm, Judy Graves, played by Shirley Temple, discovers when she undertakes to make an aviator out of her father on the "Junior Miss" broadcast Wednesday at 9:00 p.m. over WABC. The trouble starts when Fuffy Adams' aeronautical cousin expresses the urgent need of a pilot for his plane. Always one to help out, Judy thereupon elects her father to do the honors, and the resulting climax sends the entire family, including Hilda, the maid, into a merry tailspin. 8 p.m.--Shirley Temple (WBBM): bonds and boots for victory. SHIRLEY TEMPLE IN "JUNIOR MISS" (KTSA8:-8-30 p. m. The Graves family's young hopeful, Judy suffers further growing pains. 8 p.m.--Junior Miss (WBBM): Shirley Temple as Judy Graves suspects her sister, Lois, will elope. Shirley Temple, who plays that captivating minx, Judy Graves, gets an idea that her elder sister, Lois, is about to elope during dramatization of "Junior Miss," on Wednesday. (KTSA, 8-8:30 p.m.). On this premise, young Judy scampers around in her own way to foil Cupid's plans and before she finishes involves Papa and a lawyer, a bad case of indigestion, and the local air raid post. Barbara Eiler is cast as Lois, who causes allthe confusion. 8 p.m.--Junior Miss (WBBM): Shirley Temple as Judy Graves gets new trombone on trial. With a shiny new trombone, which she gets on trial, Shirley Temple In the role of Judy Graves gives a free concert to all the neighbors in her apartment house. Somehow they don't care for it. What happens forms the basis for an amusing chapter in the saga of Junior Miss" Wednesday, August 5 (KTSA 8:00-8:30 p. m.). 8 p.m.--Junior Miss (WBBM): is visited by second cousins; Judy played by Shirley Temple. 8 p.m.--Junior Miss (WBBM): Shirley Temple as Judy Graves enters father and mother in "typical American contest." 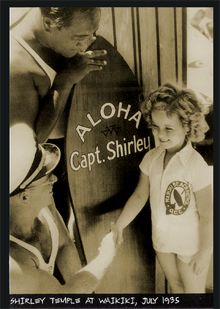 Birthplace: Santa Monica, California, U.S.A.
Shirley Temple is presented a commemorative surfboard during her 1935 visit to the Hawaiian Islands. Shirley Temple at CBS mike for Shirley Temple Time (1941). 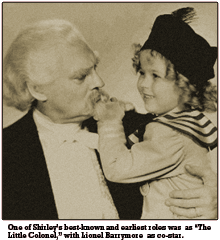 Caption reads -- One of Shirley's best-known and earliest roles was as 'The Little Colonel,' with Lionel Barrymore as co-star. 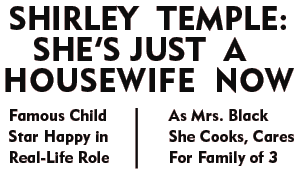 Shirley Temple, the kid who grew up in Hollywood's dream world to the tune of millions of bucks and almost as many heartaches, is "back down on earth today, the happiest housewife in Beverly Hills. In an exclusive interview, the girl who was a millionaire at and the most famous child in the world, sat in the small canyon home she has just rented, playing to the hilt her favorite role: Mrs. Charles Alden Black. For the first time since she left films and a broken marriage with Actor John Agar behind her, Shirley Temple told the story of her switch from make-believe to reality, from script to cook-book. Hollywood's "dimpled darling," who for more than 10 years kept marquee lights aglow, today is interested only in keeping the home fires burning. And she's giving a four-star performance as housewife and mother. "I'm so happy," the 25-year-old Shirley smiled as she pulled out the scrapbook she and Charles have kept since their marriage two and a half years ago. "I've found a whole new world with my husband and my children," she added as we thumbed through the pages. "I have everything I want now. I don't miss my career a bit. This book tells the story. I hope it doesn't bore you." It didn't. Thumbing through these memories with Shirley was like reliving her life with her. The pictures and clippings, so carefully pasted in by Shirley, chronicle everything that has happened to Mr. and Mrs. Black since their quiet wedding December 16, 1950. Except for the photos of some of the famous personalities they met in Washington, D.C., the book might have been kept by Mrs. Jones down the street. Instead of Hollywood glamor pictures it contains favorite Christmas cards and birth announcements from friends. There are pictures of Shirley, not all of them flattering, taken by her camera-bug husband. There's Shirley and Charles kissing in the kitchen on their first wedding anniversary and clowning it up a bit for the friend who snapped the shot. There's Shirley in jeans and shirt and no make-up playing with their boxer dog. There's Shirley and her new son, their heads cut off a bit, slightly out of focus. And, of course, there are just as many shots of Papa Black and Shirley's daughter by her first marriage, Linda Susan, 5 1/2. other activities that have, made a new world for "Little Miss Marker." The Black family recently returned to Hollywood from Bethesda, Md., where they lived in "a small rambling home" while Charles was attached to the Navy Department in Washington, D.C. Like most of her neighbors, Shirley did all her own housework. The handsome, 34-year-old Stanford graduate was recalled to active duty as a lieutenant commander shortly after his marriage to Shirley. His bride went right along, announcing that she was through with movies and that the only contract she was interested in was the one she had just signed with Charles. Today, busy getting settled in the home they have leased until they can build their own, Shirley reaffirmed that statement. But she left herself a small opening. something. But right now the only thing I'm interested in is running my home and living a normal life," added the girl whose films have earned more than $20,000,000 and who is said to have banked more than 81,000,000 herself. As to current rumors in the trade that she's agreed to star in a TV series if her husband is taken into the deal as a producer, Shirley sticks to her denials. "I don't know anything about that. I'm not even listening to offers," she insisted. "Despite the talk, I have no agent, no publicity man--and right now it's time to change my baby's diapers!" The girl who competently changed the diaper on 15-month-old Charles Alden Black Jr. still has a touch of the winsome appeal which made her a world-wide film sensation at the age of 6. But in place of the Meglin Kiddie cuteness and the later adolescent smugness, there is now the mature, natural charm of a young woman. Shirley Temple is an adult. As filmland showcase kid, whose life from dolls to divorce was duly chronicled in the daily press, Shirley has always had a certain poise. But it was the kind acquired from being continually on public view--almost a defensive arrogance. The gracious Mrs. Black who brewed a pot of coffee while we went through the scrapbook displayed a new poise, a new assurance--the kind that stems from private happiness. Though in her new role she does all her own housework, cooking and marketing, Shirley doesn't look the part of a haus-frau. A petite girl, she still could pass for a teen-ager in her simple cotton housedresses and open sandals. There were those who predicted that the cute and chubby youngster of the screen would grow up to be just plain chunky and not-so-cute. Shirley has proved them wrong. Though not the siren type, she still has plenty of appeal. She is 5 feet 2 1/2 inches tall, weighs 105 pounds. Her once golden hair is now an attractive dark brown, and not that phony mahogany movie hue, either. In place of the bouncy ringlets of her childhood and the fluffy longbob of her teen years, Shirley now has a smart shingled bob, almost wind-blown. "I guess it looks a mess today," she laughed, running her fingers through her short hair. "I wash and set it myself. But I didn't put it up last night." Shirley was wearing a smart blue cotton dress with a low, scooped neckline and red embroidery around the hem. "I seldom dress up any more," she explained. "I prefer casual clothes and I buy my things ready-made." The Black home is furnished in casual style, too. "I guess you would call it a sort of mixed-up period," Shirley laugher, explaining that she was her own decorator. The living room sofa and chairs, which date back to the Temple family home of 1941, have new plain blue and striped denim slip covers. The house is pleasant, but not pretentious. "The furniture just arrived from Maryland last week, and I'm still getting settled," she added. Shirley fingered her impressive diamond engagement ring and diamond-studded wedding circlet as she explained why she has no servants and lives so quietly. "I do my own work because there's nothing else I'd rather be doing. I like to cook. What's more, I'm pretty good at it," she said frankly. Though Shirley has always refused to discuss her financial affairs or the reports that Black is heir to a sizeable fortune, she readily admitted that money is no problem. "I guess I'm just the domestic type," she laughed, "and I've never been so happy." "WHAT'S important to me now is my marriage. To preserve marriage I've found a woman must first of all keep her husband happy. Keeping Charlie happy--that's what counts most in my scheme of things. Then come the children. If anything, the spotlight comes last.